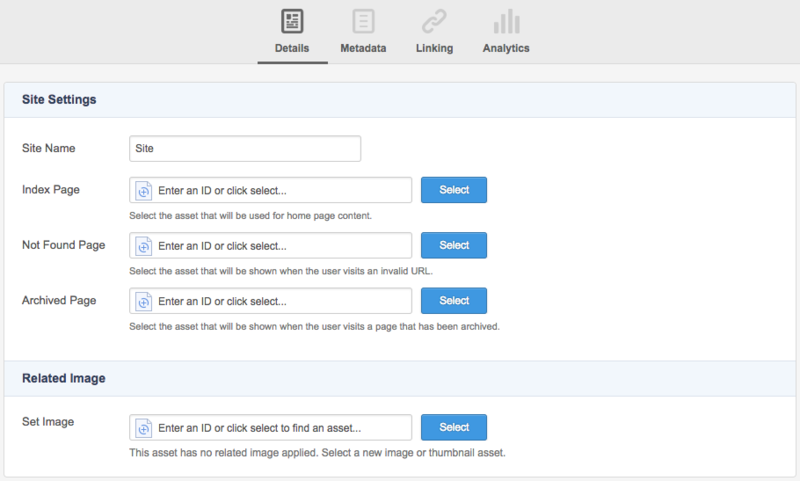 When editing a Site asset, the Details, Metadata, Linking, and Analytics screens are available. In this chapter, we will discuss the specific functionality that is available on the Details, Linking, and Analytics screen of a Site asset. For more information on generic functionality about these screens, refer to the relevant screen chapters in this manual. The Details screen allows you configure some basic settings of your Site asset. This section allows you to configure the main options for the Site. Index Page: Select an Asset that will be used for home page content. Not Found Page: Select an Asset that will be shown when the user visits an invalid URL. Archived Page: Select an Asset that will be shown when the user visits a page that has been archived. The Linking screen for a Site asset has limited functionality compared with other assets. You are able to view current Location Links to the Site however you are unable to add new Location Links. You can also re-order the direct children of the Site asset on this screen. If you have Google Analytics set up for the site and the Analytics Screen is available, it will display information for the entire site rather than just for a single page as it does for other assets.